“A Kiss to the Wind”. This stone sculpture was inspired by my little mare, Kentucky, now retired to a Quarter horse breeding ranch in Bishop, CA. She is the alpha mare in her retirees pasture. I can’t visit her often, so I keep in touch with her by tossing a kiss to the wind. I like to think my kiss finds it’s way over the Rockies and Sierras to her pasture. The sculpture was begun at the Marble/marble symposium in early July. This is a 9-day marble-carving workshop held high in the Rockies in Marble, CO. The stone is quarried at the Yule marble quarry. This is located about 10 miles outside of the tiny town, even higher in the mountains. The experience of sculpting at the symposium is exhilarating! Upwards of 60 stone sculptors meet in wooded acreage along the Crystal River. We carve beautiful native marble into stunning forms in the rain (sometimes) using power tools. We eat our meals on an enormous slab of Yule Marble fashioned into a giant dining table. Our chairs are huge chair-level blocks of marble. 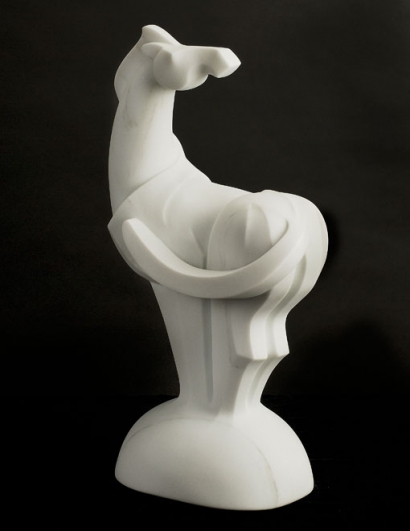 Sculptors range in experience from complete beginners to seasoned professionals. Classes are held every morning on all aspects of stone sculpture. There are fabulous instructors to answer any questions you can think up. The experience is life-changing and mind-blowing! “A Kiss to the Wind” is the result of my second symposium experience. I attended the same workshop last year, and began “Spiral Bunny,” my first large marble piece, finished the following January. I am hooked. Stone is a brilliant, brutal, prehistoric medium which yields to the hand and the imagination when approached with respect and a gentle touch. Diamond blades and grinders also help a lot.